last week I got my DEWALT DWE6401DS 5-Inch VS Disc Sander with Dust Shroud I ordered via Amazon as it was $25 cheaper that Lowes. It came as you see even with a wrench (Not pictured) to change out padded head. Keep in mind I have been using an very old DeWalt drill with a Plastic Sanding disk attachment for the last few years. If any of you have seen my CROSS-HEARTS this is what I wanted this for. I will say there is no comparison between this sander and what I had been using. What was a very nice surprise is that one may put this sanders sanding disk flat on a surface and sand away even with one hand is It will not grab and fly away like I was use to. It is Variable speed AND after you LOCK IT DOWN to run without having to depress your finger on the trigger you can adjust the SPEED while that is engaged. It came with a collector shroud which i don’t like to use. AS you can see I quickly made a mount for it in my vise using the BOLT HOLE one uses to attach the front handle to secure it to the wood mount. My only complaint is that its a little under powered and does not have a reverse. I give this tool 4 rants up! LOL! I have two DeWalt sanders and they are the bomb. Both of them are awesome! One thing i don’t like is when using it off and on, you have to wait a few seconds for it to stop before you set it down. Gunna make like a fitting so you can set it down with the pad still spinning…... I love this thing… world better than a pad on the end of a drill! I use mine a lot. My Dewalt sanders are awesome. One thing i don’t like about it is as far as I know you have to use 5-8 hole velcro sand disc paper. I don’t really care a whit about dust collection so I don’t need these holes. Was sharpening a little metal part the other day on it and it caught one of the holes and tossed mt part across the room and ripped the paper. I have a large collection of PVA 5 inch sanding paper discs trying to figure out how to use them on my deWalt sander. The Dewalt DWE6401DS model works well but starts with a violent thrust (jerk). First time I turned it on, I almost dropped it because of the thrust. I had to purchase 8-holesanding disk because my large inventory of 5-hole sanding disc became useless. The variable speed is great, but for some reason the motor seemed to heat up more at lower speeds than at higher speeds. However, without dust collection, this is worthless for woodworking. Dewalt 5 Inch sander is incredibly powerful. Far better than palm sander. I really don’t know too much about disc sanders as this is my first, but have experience with Makita tools and orbital sanders. 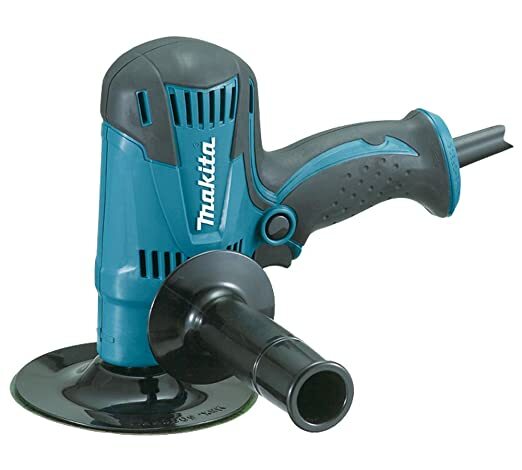 This disc sander seems to represent the Makita standard of dependable, useful ergonomics and effectiveness for my intended purpose – removing paint from wood siding. When I use the sander and dust collection system I have to be very attentive because the Makita is powerful enough that with a coarse grit disc could take off more wood than anticipated. In short, it has the power to do the job effectively and has saved me countless numbers of hours vs. using a manual scraper, putty knife, or orbital sander. So far, the GV5010 has not slowed down due to any pressure I exert, showed any hesitancy in rotating and is compact enough that it doesn’t overwhelm my hands or arms. This is after a good 24 hours of use.